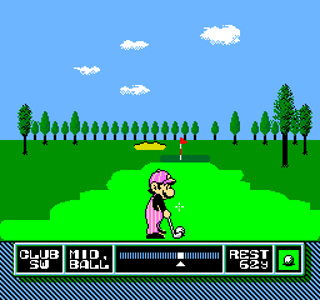 Released 6 years after its predecessor, the simply-titled “Golf”, NES Open Tournament Golf was the second golf game released by Nintendo for the NES. The game features three courses; US, Japan, and the UK, and has three game modes; stroke play, match play, and a tournament mode. You can also practice single holes to tighten up your game. This installment is a huge improvement over the original, fixing every complaint I had about the previous title. You can aim your shot much more accurately, and the game displays the distance of each shot as well as the distance remaining to the pin. It also not only displays the maximum range of each club, but automatically chooses the appropriate club for each shot, although you will at times find yourself switching to the next club up or down depending on weather conditions. Much like the Game Boy version of Golf, this game automatically saves your progress after each hole. The coolest feature of this game is the fact that it saves a virtual video of your play on any hole on which you score a birdie, albatross, eagle, or hole-in-one. As usual, you play as Mario. Princess Peach acts as your caddy, but for some reason the little picture of her in the corner of the screen makes her look either drunk or cross-eyed. The background music is annoying, but thankfully can be disabled in the options menu. The graphics are as good as a game is going to look on the NES, and the overall presentation is top-notch. NES Open Tournament Golf is easily the best golf game on the system and I would have given it a perfect score, but I don’t see it having mass appeal outside of fans of the sport. Buy NES Open Tournament Golf on GameGavel or Amazon. Tagged Golf, NES, NES Open Tournament Golf, Nintendo, Review, Sports. Bookmark the permalink.